It's summertime here in the northern hemisphere. Children are out of school, birds are singing, the sun it is shining and all right-thinking people are planning that break from the quotidian we call... a holiday. Photographers especially look forward to new locations, people and happenings against which to test their prowess. So, what to pack for your trip? 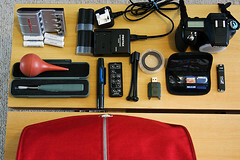 In this, the first of two articles, I'll help you by providing a handy checklist based on the following picture, which shows my travel kit, more or less. (Click to get larger versions of all the included images, via Flickr.) Read on for tons of handy tips. 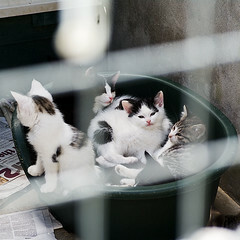 This Sunday 21 June 2009 is the open house day for Limerick Animal Welfare. Come on out to visit and meet the animals, learn tips for taking care of pets and enjoy some complementary refreshments. Walk your favourite dog or kick back and view some agility demonstrations. There are cats, bunnies, pigs, goats and ponies as well! Drop by from noon to 4pm. This post is inspired by the Pentax K-7, the first Pentax camera to shoot proper motion video, in HD no less. A lot of still photographers have little experience with video; while I am not a video expert I do know something about sound. So I hope this will be a useful introduction. This article will outline seven approaches to capturing sound for video, in order of increasing complexity, cost and quality. I will mention some specific products along the way. These are illustrative; other products may do just as well. But these have been recommended by many.